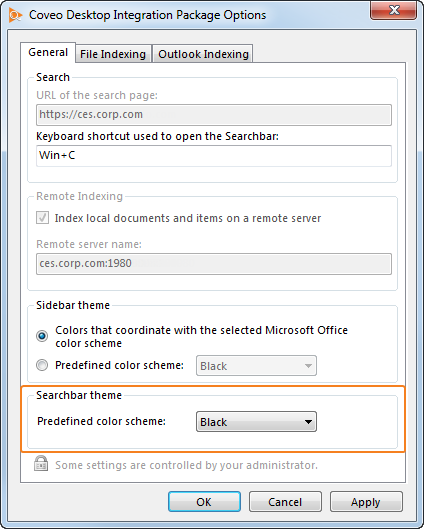 You can select the color scheme used by the Coveo Desktop Searchbar. Note: It is also possible to create a Desktop Searchbar custom color scheme (see Creating a Custom Color Scheme for the Desktop Searchbar in the Windows Registry). From the Windows taskbar, in the system icon tray, right-click the Coveo Desktop Integration Package icon , and then select Options in the menu. In Microsoft Outlook, from the menu, select Coveo > Options. In the Searchbar Theme section, in the Predefined color scheme drop-down list, select one of the available Searchbar color presets.